Turkish yard Turquoise Yachts has revealed its latest project, a 56 metre explorer yacht with modern classic styling by André Hoek. Currently under construction in Istanbul ahead of a planned February 2019 launch date, the as yet unnamed yacht will feature an aluminium superstructure and an ice classed hull, suitable for exploring Polar Regions and navigating the Northwest Passage. The yard adds that although Hoek’s design is reminiscent of classic steam ships, it will be packed with all the latest modern technology such as a diesel-electric propulsion system. Meanwhile, the state-of-the-art satellite communications dome is integrated into the composite funnel, while the canoe stern conceals an extendable boarding platform with retractable stairs for ease of acess. The interior décor is being developed by Hoek Naval Architects in collaboration with British design studio Vickers, featuring subtly classic touches and teak detailing throughout. Intimate cosy indoor spaces contrast with the expansive open decks, giving guests a wide range of relaxation options on board. 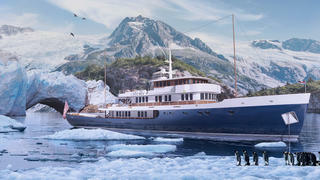 In total, this 56 metre explorer yacht will have an internal volume of 785GT spread across four decks. No further details have been released for now, but owner’s representation and project management is being provided by Masters Yachts Consultancy. Other superyachts currently under construction at the Turkish yard include the 74 metre Project Barracuda, the 66 metre Project NL233, and the 80 metre Project VY 80, all of which are due to hit the water in 2019. The 77 metre Project NB63 completes the yard’s impressive order book, with a 2018 launch slated.